No time constraints. No one needing me at work. No one needing me at home. No pressure. Those were the absolutes I had staring me in the face as I went out for today’s run. I had initially planned a quick lunch run for today. 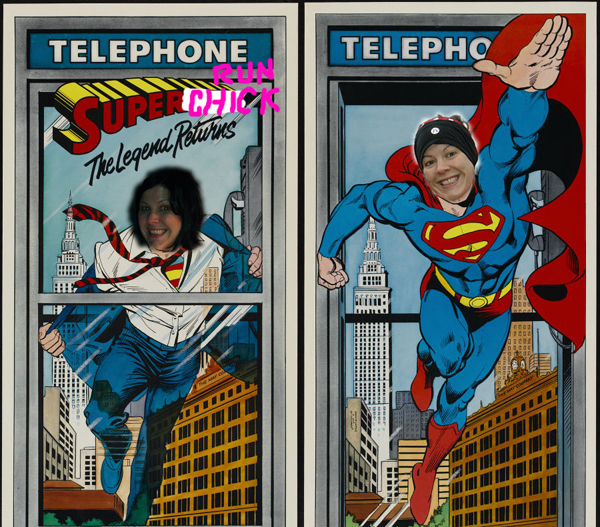 I had even dressed in layers before heading to work with my running gear on under my professional wear – seriously, if I had a phone booth, I could have totally been like the running, female version of Clark Kent. Heck, I’m a newspaper journalist, I was wearing superhero tights, and all I needed to do was rip my clothes off and I was good to go. Super-RUN-Chick! But, a few obstacles got in the way. One of which, I forgot my lunch at home, and because I work more than an hour away, there was no going home to get it, which meant I had to grab a lunch from elsewhere taking away precious running time. So, instead, I worked through lunch, which meant an early departure for me, which meant I had absolutely no pressure tainting my run. That, my friends, is the recipe for a pretty, freaking awesome run! I chose to run through my old, teenage stomping grounds (about 45 minutes from home). I haven’t run this route in probably more than two years now, since before Little Ring was a Little Alien in my belly. And you know what, I’d forgotten just how much I love it. It doesn’t matter how many beautiful places my feet have run (my backyard boardwalk, Vancouver Seawall, Oregon Coast, Sonoma County, San Francisco…) this route, and this area will always be dear to me. It’s the memories route… memories of years gone by, of people who were once so prominent in my life long gone, and others who are still very much in my heart, my teenage home, friend’s houses, the homes of boy crushes, my first kiss, schools, ravine hangouts. Pretty much every stride I took had a memory or thought or wonderment filling my head. And before I knew it, the run was done. Wow! That post-run blood sugar is insane, and the crazy thing, I had no idea it was that low… I’ve been struggling with lows following runs lately, but I’m working on it. Hopefully a better reading the next one. I’m always going to think of you busting out of your clothes and flying around in a cape now! These kinds of runs are the best! You have a boardwalk in your backyard? Awesome! Sounds like the perfect run! I love those unexpected runs of pure pleasure. No fun having that low at the end! I find that running is the sport that tanks my sugars. I usually start at around 9.0 and set a 50% basal rate an hour before heading out, lasting another hour (so 2 hours in total). Any run more than an hour I definitely need carbs. Hope you figure it out! I love following your adventures.